A classroom in Jamaica. In some of our projects, IRN desks and chairs have replaced rocks and treestumps. Around the world, hundreds of millions of children are missing the most basic elements for an education: a desk and a chair. 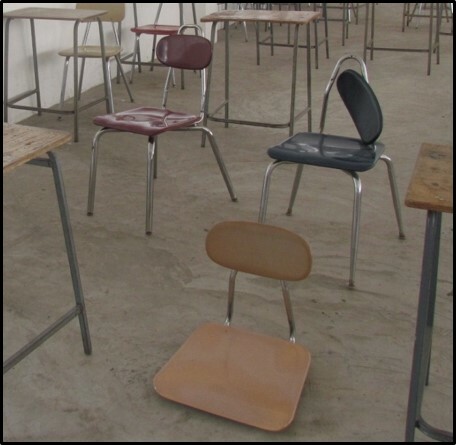 Here in America, thousands of charter and tribal schools, community centers, and other local groups need to find furnishings at the lowest possible cost. Meanwhile, thousands of public schools in America replace old furniture every year. Almost all of it ends up getting thrown away. Why? Why do these fundamental school resources, with worldwide demand, end up in landfills? There’s no one to make the match. No school or district is set up to identify and reach out to the dozens or hundreds of organizations that might be able to use their furniture. There’s no one to manage the project. Nor is any school or district set up to arrange and manage moving, loading, and transportation of truckloads of furniture, with all the associated paperwork and financial transactions. This is what IRN does. It’s all that IRN does. Our only mission is to match used, usable furniture with schools and nonprofits that need it, and then manage the transfer. Loading furniture, Wellesley (MA) High School. 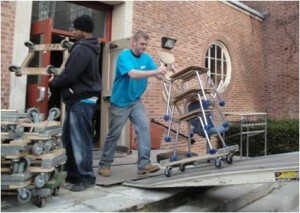 This project filled 21 trailers with furniture, which was provided to children in several Caribbean nations. Since 2010 we’ve filled 500 tractor trailers with student desks, chairs, and other furniture from 61 schools and districts from Maine to California. We’ve matched these items with dozens of charter and tribal schools, furniture banks, community centers, and other nonprofits in the United States, and international charities working in 22 countries in the Central and South America, the Caribbean, Europe, Africa, and Asia. That’s about 90,000 pieces, more than four million pounds of good, usable school furniture kept out of U.S. landfills, and provided where it is truly needed. What, exactly, do we do to make this happen? We’ve been arranging reuse of surplus furnishings for 15 years. We have a network of hundreds of charter and other schools, relief and development agencies, furniture banks, and other nonprofits that can accept, redistribute, and assure the reuse of your furnishings. When you call us with an inventory, we identify the organization(s) most likely to need those particular furnishings. We reach out and work with them until the entire inventory is claimed. Then we set up and manage movers, we set up and manage transportation, we handle the paperwork, and we put a project manager onsite to assure that everything goes to plan. We provide documentation so you know exactly where each item of your old furniture has gone and who is using it. We make the match, and we manage the project. After: Furnishings from Tahanto Regional Middle/High School (MA) unloaded and making a difference. Here’s a selection of photos showing furniture from IRN projects installed, in use, and making a difference. The way we see it, we’re helping American educators extend their mission and success, by providing basic resources to needy schoolchildren in the U.S. and worldwide. There’s more need for these furnishings than we can ever supply. As they face huge social, environmental, diplomatic, health, and other challenges in the 21st Century, education is the most important resource we can provide to the next generation. Our excess furnishings are an essential part of the equation.